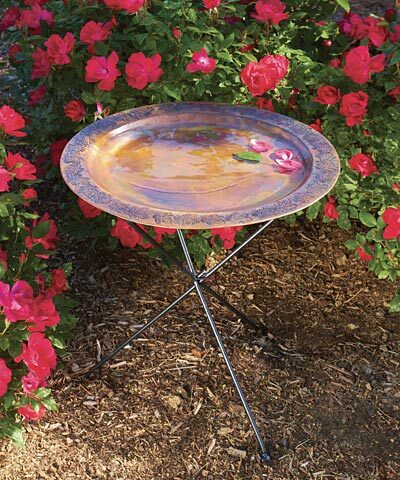 Provide a generous and beautiful bathing spot for your feathered friends with the Ancient Graffiti Copper Plated Metal Standing Ivy Bird Bath. The elegant finish and traditional motif enhance your backyard easily, and its significant size will surely be a focal point. Ivy leaf shapes adorn the 2.25" wide rim of this bath, and their dark outlines contrast the flamed copper colored finish for drama. A gentle slope from this rim leads to the 17" diameter basin, and the 0.75" depth keeps small birds safe. The rim offers plenty of perching area, and the metal construction forms a durable accent. Place this bath on the included, 24.75" tall stand, so it rests perfectly among your shrubs. The black, metal stand offers hardy support, and its three legs ensure stability on a level surface. Sink the legs into the ground slightly for more versatility in displaying the bath. Slightly iridescent sections on the flamed copper colored basin react in sunlight, while the finish changes over exposure to the elements for a striking look. Help all your feathered friends stay clean and hydrated with this Copper Plated Metal Standing Ivy Bird Bath.